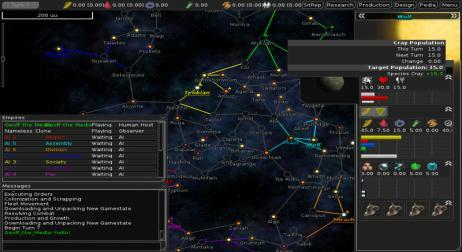 FreeOrion is a free and open source community-developed 4X turn-based galactic empire strategy game with interactive 3D combat. I have not played the game extensively; but what I did play looked great. a lot of the minor disappointments in MOO2 have been addressed. you can have a truly IMMENSE number of stars. my overall impression is that the developers tried to build a game on the concept of what MOO3 was supposed to be, that would actually be playable, and I think they may have achieved that.